The name makes me want to gently rest my face in the palm of my hand. Really? “Zafehouse”? But then I went on to read the features, look at the screenshots and watch the video. Annoying name aside, I’m in. 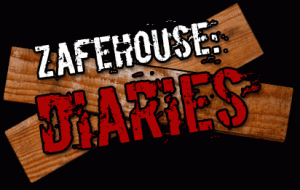 In the Zafehouse: Diaries you control the fates of people picked to live in a house during the zombie apocalypse to see what happens when people stop being polite and start getting real. Real World: Zombie Apocalypse! Hmm.. I just thought of a worse name than Zafehouse. Anyway, you start with your people, and you assign them tasks, and then they do them. A turn is an hour, and how successful they are depends on their own skill and their relationships with the rest of the people. When you finish, you get a nice AAR of the whole ordeal to share with your friends. It’s available for sale now, but I’m on holiday lockdown – no buying anything for myself until the new year. I look forward to being able to give this a try, even more so if they manage to get approved for Steam, because I love having all my games in Steam.